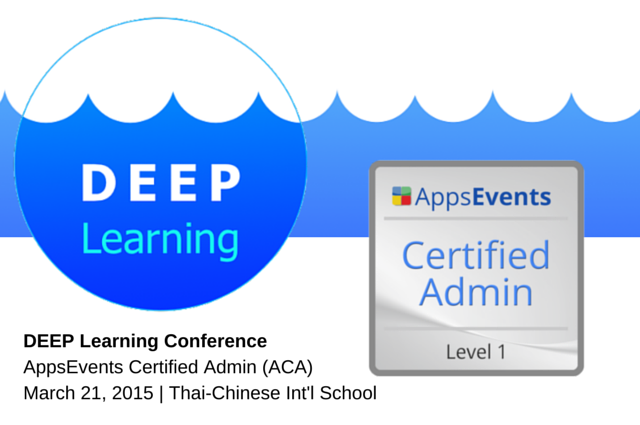 Good news to all educators based in Bangkok and neighboring cities who are interested in taking our in-person Google Apps Admin Certification course, as AppsEvents in cooperation with the DEEP Learning committee brings you the ACA strand to the Deep Learning Teaching Innovations Conference Bangkok. The ‘AppsEvents Certified Admin’ (ACA) is an entry level certification and focused on getting educators with basic or no admin experience to 'level up' and be able to administer a Google Apps domain. It’s equally focused on teaching and non teaching staff and one of the reasons we started the program was to help with the democratization of IT admin and helping more teachers to get involved. It is intended for someone coming in to an ‘up and running’ Google Apps domain and does not include set-up, which we cover in our advanced ‘Level 2 certification’. More information available here. The DEEP Learning Conference offers innovative teaching and learning experience by bringing the best of many worlds together and will take place at Thai-Chinese International School from March 21 to 22, 2015. The conference takes pride in giving a professional development event where such emphasis has been placed on giving you the ability to craft your own personal experience. Learn more here.